Tamarind spare ribs from Chef Mark Miller, available at MackenzieLtd.com. This is Page 9 of a nine-page glossary, including terms such as sopressata, spare ribs, speck and terrine. Click on the black links below to visit other pages. See our 60+ other food glossaries. Sodium nitrite is used as a color fixative and preservative in pork and other meats and fish. In addition to holding the pink and colors in pork products when heat is applied—bacon, frankfurters, hams, sausages, etc.—it prevents the growth of Clostridium botulinum, the bacteria which cause botulism. 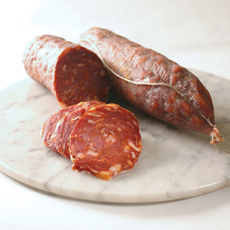 Sopressata is a southern Italian cured sausage that originated in Calabria. It is made of coarse-ground pork, so it has a different texture and flavor than the more widely known, finer-ground salamis. Pressing gives it an uneven, rustic appearance when sliced. Hot Sopressata is seasoned with garlic, salt and hot peppers, and hung to cure and dry for up to nine months in a natural casing to develop a full, rich pork flavor. Sopressata is sliced thin and served as an antipasto, with aged cheese, marinated peppers, olives or giardiniera. * It is also eaten as a snack on crackers or on sandwiches. *A mixture of pickled vegetables, Italian in origin, that can include carrots, cauliflower, celery, onions, red bell pepper and zucchini, carrots and cauliflower, pickled vegetables in red- or white-wine vinegar. It is typically eaten as an antipasto, and is also delicious on sandwiches. Spare ribs come from the belly side of the pig’s rib cage—above the sternum and below the back ribs, which extend about 6" down from the spine. Compared to the curved baby back ribs, spare ribs are longer, but flatter and heavier, and contain more bone than meat. However, the greater proportion of fat makes spare ribs more tender than baby back ribs, and the ribs are full of meaty flavor. The name “spare ribs” may relate to the spare amount of meat on the ribs. 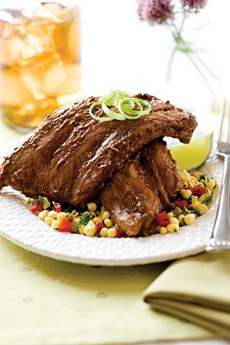 These ribs are also known as Chinese spare ribs. 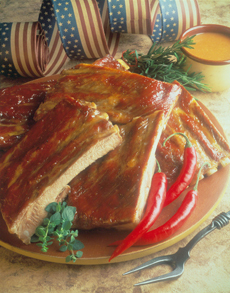 In American cuisine, spare ribs are often smoked and then grilled for barbecue. St. Louis style ribs have had the sternum bone, cartilage and rib tips removed so that the shape is almost rectangular. Kansas City style ribs are trimmed even more closely, with the hard bone removed. An American favorite. Photo courtesy National Pork Board. There are two types of speck: German and Italian. Italian speck, from the northern region of Italy, is a type of prosciutto that is both cured and smoked. It is rubbed with juniper and other herbs and spices, plus salt and pepper. It is dry-cured for about two weeks to preserve the meat, then lightly cold-smoked over beechwood chips, then aged to tenderness. No additional cooking is needed. German speck is identical to Italian lardo. An Italian word for skewers of meat or fish grilled over a flame or under a broiler (i.e., kabobs). A suckling pig is a piglet feeding (suckling) on its mother’s milk. It is slaughtered between the ages of two and six weeks and traditionally roasted whole. A special-occasion dish, it was enjoyed by the ancient Chinese and Romans, and remains a festive dish in contemporary cuisine. It is most popular today in Spain and Spanish-speaking countries, where it is called lechón (from leche, milk). It is the national dish of the Philippines, where it is called litson. 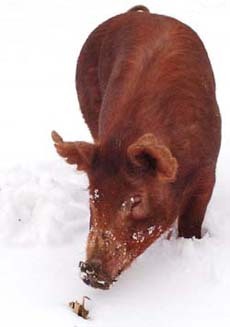 The Tamworth is an old English breed, descended from native pigs (descended from wild boars), crossbred with Irish pigs. It is distinguished by its red or ginger coloring. It is one of the oldest of pig breeds, but as with many “heritage” breeds of livestock, it is not well-suited to modern mass production methods, which want a large animal that grows quickly. With only a few hundred registered breeding females, the species is listed as “threatened” in the U.S., with a similar designation in the U.K. It is known as a “bacon pig” for its ample belly, which produces more bacon than other breeds. It is also known for its inquisitiveness and intelligence—breeders call them “too bright for their own good.” See heritage pork. Tamworth pig. Photo courtesy FlyingPigsFarm.com. Pork tenderloin makes an elegant entrée for a small dinner party but also can be roasted or grilled whole for quick weeknight dinner. When sliced crosswise (like a loaf of French bread), the resulting medallions also may be sautéed. The tenderloin comes from the full pork loin. As the name indicates, the tenderloin is one of the most tender cuts of pork. Typically, pork tenderloin weighs between ¾ and 1 ½ pounds. 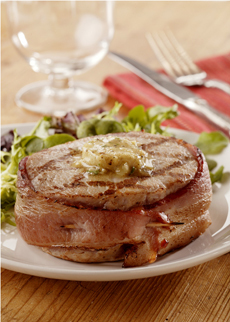 A slice from a pork tenderloin, larded with bacon and topped with herb butter. 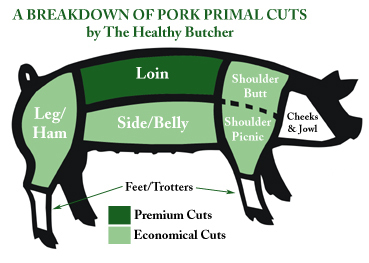 Photo courtesy National Pork Board. 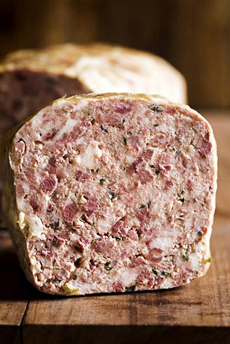 A terrine refers to a vessel or the pâté prepared in it. A traditional terrine is a glazed earthenware cooking dish, oblong or oval, with vertical sides and a tightly fitting lid. Modern versions are also made of enameled cast-iron. Ground, flavored meat, seafood or vegetables are pressed into the terrine and chilled. Portions can be sliced from the terrine, or the entire terrine can be turned out onto a plate. Italian for “yule log,” this term also refers to a long boneless pork roast. 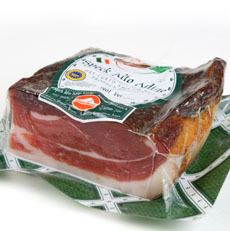 A turned out terrine of pâté campagnola, available from FraMani.com. Trotters, also known as pig’s feet (and pied du cochon in French), include both the front and back feet. They fall under the category of eating “everything but the squeal”—nothing is wasted. The French often prepare them by splitting them down the middle when sold raw. This allows the marrow and the gelatinous connective tissue to dissolve during cooking. Trotters can be boiled; boiled and breaded, then baked; broiled or deep-fried; pickled or barbecued. 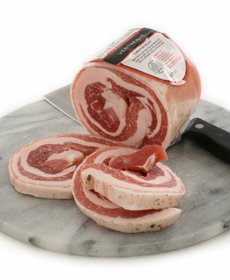 Ventrèche (von-TRESH) is French version of pancetta, made from the stomach muscle of the pig. It is typically sliced thin, seared, and used in cassoulet, salads, on canapés and to wrap around other foods, such as scallops or quail. It can be substituted for bacon in any recipe. Ventrèche is available from iGourmet.com.